The SQL RTRIM is one of the SQL String Function, which is used to remove the empty spaces from the Right hand side of a character expression. 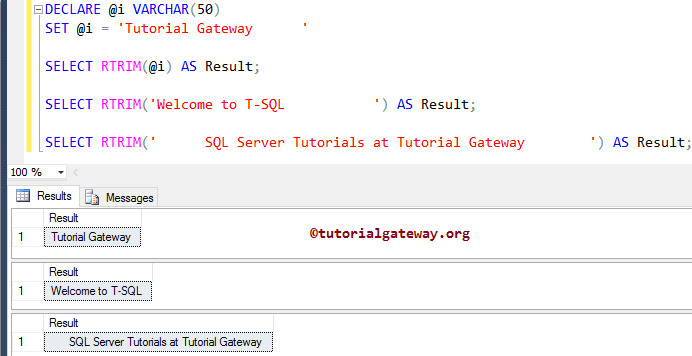 In this article we will show you, How to write / use RTRIM in SQL Server with example. Character_Expression: Please specify the valid Expression on which you want to remove tailing empty spaces (performing trimming on right side). The SQL RTRIM Function will remove the tailing blanks from right side of this expression. This Character_Expression can be a variable, constant, or column of any data type, except image, text, and NText. The RTRIM Function is used to return the character expression after removing the empty spaces from the right side of the given expression. The following query will show multiple ways to use RTRIM function. Below lines of code is used to declare VARCHAR variable and assigning the string data. From the above statement, you can see that it had some tailing spaces after the string ‘Tutorial Gateway ‘. Following statement will remove those extra spaces from the right side of a string variable. Here, We used the ALIAS Column to assign new name to the expression result as ‘Result’ Column. You can see from the below statement, statement had some leading spaces before and after the string. Following statement will remove the extra spaces from only the right side of the specified expression. 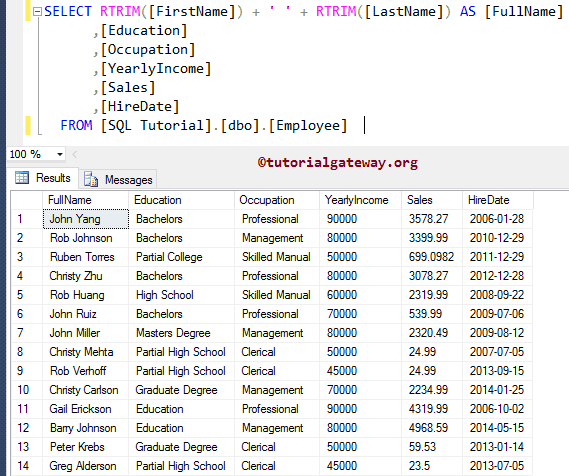 This example will show you, How we are going to use the SQL RTRIM function on Column Names. Generally, we may get data with some extra spaces due to typing mistake, or any other data entry issues, and if you find such data then, you have to use this RTRIM or LTRIM to trim those extra spaces. 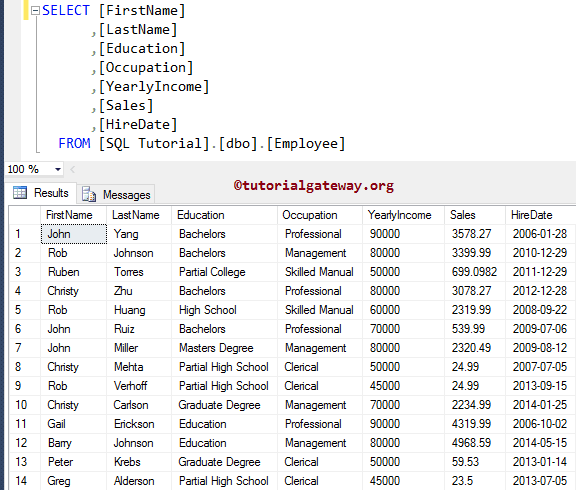 The following SQL rtrim statement will remove white spaces from right hand side of the [FirstName] column and [LastName] column.